Tap your ruby slippers together and open your eyes to the magical views of Oz. Join us Saturday, March 23rd at the Centurion Conference Center at 6pm to experience an extraordinary night in Oz: explore Munchkin Land with Loran Illusionist and enjoy a 4 course meal in the marvelous Emerald City while being entertained by our stand-up comedian Dylon Rainey. 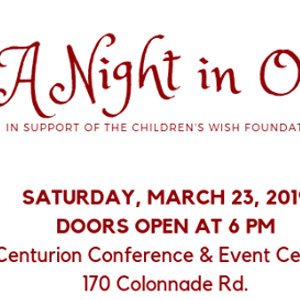 Come immerse yourself in the world of Oz with extraordinary entertainment, music and dance that will be sure to astonish you while supporting the Children's Wish Foundation. Just like Dorothy, you’ll be sure to say “I have a feeling we’re not in Kansas anymore”.